The Sisters Brothers is a 2018 western dark comedy directed by Jacques Audiard from a screenplay he co-wrote with Thomas Bidegain, based on the novel of the same name by Patrick deWitt. An American and French co-production, it is Audiard's first work in the English language. The film stars John C. Reilly (who also produced) and Joaquin Phoenix as the notorious assassin brothers Eli and Charlie Sisters, and follows the duo as they chase after two men (Jake Gyllenhaal and Riz Ahmed) who have banded together to search for gold. The film had its world premiere at the Venice International Film Festival on September 2, 2018, where it won the Silver Lion for Best Direction, and was theatrically released in the United States on September 21, 2018. The Sisters Brothers received positive reviews from critics, with most praise going to its performances (particularly those of Reilly and Phoenix), characters, direction and soundtrack. However, it was a box office bomb, grossing $10 million against its $38 million budget. Set in the American West in 1851, brothers Eli and Charlie Sisters are gunfighters hired by a wealthy businessman, known as the Commodore. He tasks them to kill a man named Hermann Warm who he claims has stolen from him. John Morris, a private detective, has been engaged by the Commodore to track Warm down and hand him over to the Sisters brothers. Morris finds Warm traveling by wagon train to California with the Gold Rush and befriends him. They travel to Jacksonville where, unbeknown to Warm, Morris has arranged his rendezvous with the Sisters brothers. Warm finds Morris’ handcuffs, realizes his true intentions, and threatens him at gunpoint, but Morris overpowers him. Warm reveals that he is en route to find gold using a chemical formula of his own invention; the Sisters brothers have been sent to retrieve the formula, most likely by torturing Warm before killing him. Refusing to allow an innocent man’s murder, Morris frees Warm and the two leave Jacksonville. On the road toward San Francisco, Warm reveals that his ultimate plan is to create a utopian society, free from greed and other social ills, in Texas. Meanwhile, the brothers' pursuit is plagued by misfortune. A grizzly bear attacks their camp and mauls a horse, Eli almost dies from a poisonous spider bite, and Charlie is repeatedly drunk and too hung over to ride. When they discover Morris' betrayal in Jacksonville, they follow the pair to Mayfield. At Ms. Mayfield's hotel and brothel, she denies having seen Warm and Morris, but offers the brothers a warm welcome. A sympathetic prostitute warns Eli of an impending attack, and he attempts to leave with a drunken Charlie, but they are cornered by gunslingers hired by Mayfield. The brothers kill the gunslingers and interrogate Mayfield as to Warm's and Morris’ whereabouts, before murdering and robbing her. In San Francisco, Charlie and Eli stay at an expensive hotel and argue about continuing their hunt. Eli wishes to retire, using the money they have saved to open a store, but Charlie angrily rejects this idea and hits Eli before storming out. The next day, Charlie tries to pretend nothing happened, but Eli strikes him across the face. Charlie then reveals that he has found a claim staked in Morris’ name a few days' ride away. Eli agrees to complete the hunt as their final job. On the way to the claim site, the brothers are ambushed and captured by Warm and Morris, who are then attacked by Mayfield's men sent before her death to claim the formula for herself. The four men team up to kill Mayfield's men, after which Charlie and Eli agree to help Warm and Morris find gold in exchange for half the takings. Warm and Morris decide to prospect together and create a phalanstère in Dallas. Working to dam the river, the new partners develop a surprising camaraderie. Eli reveals to Warm that Charlie killed their abusive, alcoholic father when they were young, and that Charlie's short temper and violent tendencies put him in danger, so Eli reluctantly took up their present employment to protect him. The dam is completed, and Warm explains that when his chemical formula is added to water, it causes gold ore to glow briefly, but is extremely caustic. The men pour the formula into the river and begin gathering the gold. When the glow begins to fade, Charlie panics and tries to add more formula, but spills the undiluted substance onto his hand and into the river. Eli rushes out of the river to restrain Charlie, while the undiluted formula badly injures Warm and Morris. Warm succumbs to his injuries the next day, while Morris shoots himself to end his suffering. Eli takes Charlie to the nearest town, where a doctor amputates his arm. Hired guns sent by the Commodore arrive and demand their surrender. Eli shoots them, and he and Charlie decide they must kill the Commodore. They travel north again, evading and fighting others sent by their former employer. The stream of hired guns eventually stops, to the brothers' puzzlement. They arrive in Oregon City to find that the Commodore has died; Eli punches the corpse "just to make sure" before he and Charlie depart. The brothers return home to their mother; though initially suspicious, she welcomes them in. In 2011, it was announced that the film rights to the novel The Sisters Brothers had been sold to John C. Reilly's production company, and Reilly was set to play one of the brothers. Four years later, French director Jacques Audiard announced on the radio station RTL that he would direct the film, his first English-language feature. On April 25, 2016, Deadline Hollywood reported that Joaquin Phoenix had joined the project. In February 2017, Variety reported that Jake Gyllenhaal had also been cast, later announcing that Riz Ahmed joined as well. In May, Variety stated that Annapurna Pictures would also produce and co-finance the film, alongside Why Not Productions, with Megan Ellison serving as an executive producer on the project. The film started shooting in early June 2017 in the Spanish city Almería, and continued the shoot throughout the summer in Tabernas, Navarre and Aragon. The Sisters Brothers had its world premiere at the Venice Film Festival on September 2, 2018. It was also screened at the Toronto International Film Festival on September 7, and was theatrically released on September 21, 2018. Annapurna paid between $7.5–9 million for the North American distribution rights. 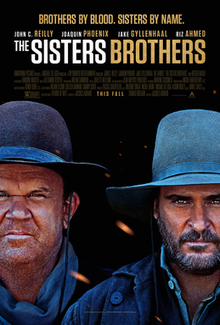 As of April 13, 2019[update], The Sisters Brothers has grossed $3.1 million in the United States and Canada, and $7.6 million in other territories, for a total worldwide gross of $10.8 million, against a production budget of $38 million. During its limited opening weekend, on September 21st, the film grossed $115,575 from four theaters, an average of $28,894 per venue. It expanded to 27 theaters in its second weekend, making $233,258, and to 54 theaters in its third, grossing $203,525. By its seventh weekend of release, the film had crossed $3 million domestically, after grossing $66,665 in 146 theaters that weekend. Its widest release was at 1,141 theaters. On review aggregation website Rotten Tomatoes, the film holds an approval rating of 86%, based on 181 reviews, with an average rating of 7.34/10. The site's critical consensus reads, "The Sisters Brothers rides familiar genre trails in occasionally unexpected ways - a satisfying journey further elevated by its well-matched leading men." On Metacritic, the film has a weighted average score of 78 out of 100, based on reviews from 44 critics, indicating "generally favorable reviews". Peter Bradshaw of The Guardian gave the film 4 out of 5 stars, calling it "resoundingly enjoyable and funny". William Bibbiani of IGN assigned it an 8.0 out of 10, saying, "John C. Reilly and Joaquin Phoenix shine as wild west hitmen who are just smart enough to know they should be smarter, [and] whose quest leads them in unexpected, funny, and surprisingly emotional directions." Owen Gleibermen of Variety wrote, "The Sisters Brothers is too light to be a true drama and too heavy to be a comedy." The film earned a warm response, including a standing ovation, at the 75th Venice International Film Festival. Jacques Audiard won the Silver Lion for Best Director at the festival. ^ "The Sisters Brothers". Toronto International Film Festival. Retrieved 24 July 2018. ^ a b "Annapurna Upheaval: Megan Ellison Is 'Reevaluating' Film Division Amid Money Woes". TheWrap. 10 October 2018. Retrieved 10 October 2018. ^ a b "The Sisters Brothers (2018)". The Numbers. Retrieved 13 April 2019. ^ Charles, Ron (11 November 2011). "Patrick deWitt's 'The Sisters Brothers' wins Governor General's Award in Canada". The Washington Post. Retrieved 15 June 2017. ^ Mintzer, Jordan (24 August 2015). "Palme d'Or Winner Jacques Audiard Reveals First English-Language Feature". The Hollywood Reporter. Prometheus Global Media. Retrieved 15 June 2017. ^ Jaafar, Ali (25 April 2016). "Joaquin Phoenix In Talks To Join Jacques Audiard's English-Language Debut 'The Sisters Brothers'". Deadline Hollywood. Retrieved 15 June 2017. ^ Kroll, Justin (10 February 2017). "Jake Gyllenhaal Joins Joaquin Phoenix in 'The Sisters Brothers' (EXCLUSIVE)". Variety. Penske Business Media. Retrieved 15 June 2017. ^ Kroll, Justin (18 April 2017). "Riz Ahmed Joins Joaquin Phoenix and John C. Reilly in 'The Sisters Brothers' (EXCLUSIVE)". Variety. Penske Business Media. Retrieved 15 June 2017. ^ Lang, Brent (19 May 2017). "Annapurna Nabs Joaquin Phoenix, Jake Gyllenhaal Western 'Sister's Brothers'". Variety. Penske Business Media. Retrieved 15 June 2017. ^ Randle, Emma (8 June 2017). "'Big guns' arrive for French-made western". Costa News. Retrieved 15 June 2017. ^ Vlessing, Etan (24 July 2018). "Toronto: Timothee Chalamet Starrer 'Beautiful Boy,' Dan Fogelman's 'Life Itself' Among Festival Lineup". The Hollywood Reporter. Prometheus Global Media. Retrieved 24 July 2018. ^ Anthony D'Alessandro (10 October 2018). "The Reasons Behind Annapurna's Tumultuous Week". Deadline Hollywood. Retrieved 10 October 2018. ^ D'Alessandro, Anthony (23 September 2018). "'The House With A Clock In Its Walls' Sounding Near $27M Alarm; Counterprogramming Still In Deep Sleep". Deadline Hollywood. Penske Business Media. Retrieved 16 October 2018. ^ D'Alessandro, Anthony (30 September 2018). "'Night School' Top Of The Weekend's Box Office Class With $28M; Best Opening For A Comedy So Far This Year". Deadline Hollywood. Penske Business Media. Retrieved 16 October 2018. ^ D'Alessandro, Anthony (9 October 2018). "'Venom' Flies To Near $90M; 'A Star Is Born' Has Rhythm With $51M As Monday Fall Holidays Propel Box Office". Deadline Hollywood. Penske Business Media. Retrieved 16 October 2018. ^ Brooks, Brian (4 November 2018). "'Boy Erased' With Robust Bow; 'A Private War' Aims OK: Specialty Box Office". Deadline Hollywood. Penske Business Media. Retrieved 4 November 2018. ^ "The Sisters Brothers (2018)". Rotten Tomatoes. Fandango Media. Retrieved 13 April 2019. ^ "The Sisters Brothers Reviews". Metacritic. CBS Interactive. Retrieved 13 April 2019. ^ Bradshaw, Peter (2 September 2018). "The Sisters Brothers review: Jacques Audiard saddles up for a subtle and funny western". The Guardian. Retrieved 23 November 2018. ^ Bibbiani, William (20 September 2018). "The Sisters Brothers Review". IGN. Retrieved 23 November 2018. ^ Gleiberman, Owen (2 September 2018). "Film Review: 'The Sisters Brothers'". Variety. Retrieved 23 November 2018. ^ Variety Staff (2 September 2018). "'The Sisters Brothers' Impresses Audiences in Venice". Variety. Penske Business Media. Retrieved 4 September 2018. ^ Anderson, Ariston (8 September 2018). "Venice: Alfonso Cuaron Wins Golden Lion for 'Roma'". The Hollywood Reporter. Retrieved 23 November 2018. ^ "44th César Awards - Nominees". Variety. 23 January 2019. Retrieved 24 January 2019. ^ "44th César Awards - Nominees". 23 January 2019. Retrieved 24 January 2019. ^ "IFMCA Award Nominations 2018". 7 February 2019. Retrieved 11 March 2019. ^ "The nominees for the Lumières Awards unveiled". Cineuropa - the best of european cinema. Retrieved 26 December 2018. ^ "France's Lumière awards unveil mixed bag of nominations". Screen. Retrieved 26 December 2018. ^ ""The Rider" is voted Best Picture of 2018". National Society of Film Critics. 5 January 2019. Retrieved 6 January 2019. ^ Ramos, Dino-Ray (5 January 2019). "National Society Of Film Critics Names Chloe Zhao's 'The Rider' As Best Picture". Deadline Hollywood. Retrieved 6 January 2019. ^ Kilkenny, Katie (5 January 2019). "'The Rider' Named Best Picture by the National Society of Film Critics". The Hollywood Reporter. Retrieved 6 January 2019. ^ Lemercier, Fabien (25 October 2018). "Nine candidates for the 2018 Louis-Delluc Prize". Cineuropa (in French). Retrieved 11 March 2019. ^ "2018 San Diego Film Critics Society Award Winners". San Diego Film Critics Society. 10 December 2018. Retrieved 11 December 2018. ^ Johnson, Quendrith (3 January 2019). "ROMA, A STAR IS BORN, Set for Top Honors at 23rd Satellite™ Awards". International Press Academy. Retrieved 3 January 2019. ^ Travers, Peter (19 September 2018). "Rolling Stone". Rolling Stone. Retrieved 11 March 2019.